This is another battle simulation in my 2nd Punic War Series. The rules used have been derived from my friend Jim's DBA 1.0. I've modified his original work and called my version DBA_BR. We are able to play the battle simulation with a single page of charts and rules. What I've been doing is using some of the excellent scenarios found on the Command and Colors Ancients website. I adapt the scenarios to our rules and we play out the game. 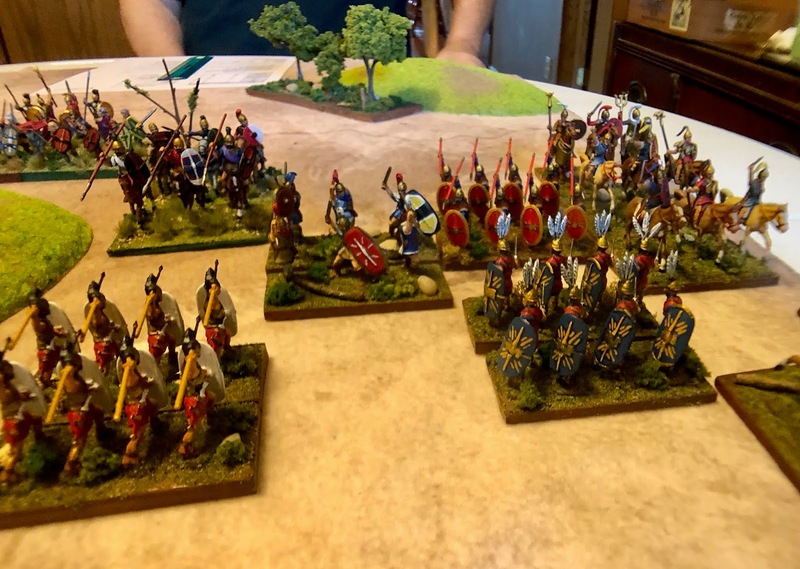 This scenario was tricky because it featured an ambush by Hannibal. In a simulation like this it generally goes against the side that is ambushed and so it was in our game. The map below is a rough representation of my 3' by 3' game table. It's all I have room for so the size of the armies and rules are constructed constructed accordingly. On the Carthaginian left there is a hidden contingent of Libyan SP, Celtiberian WB and Iberian CV led by Hannibal's brother Mago. The elements on the hill are commanded by the great man himself as is most of the main battle line. Maharbal, is the third Carthaginian leader and he is in support of Mago's hidden force. If you read the historical background below you will see that Marcus Minucius Rufus and his legion fell into Hannibal's trap. I chose to start the game just as Mago's contingent have emerged from being hidden. 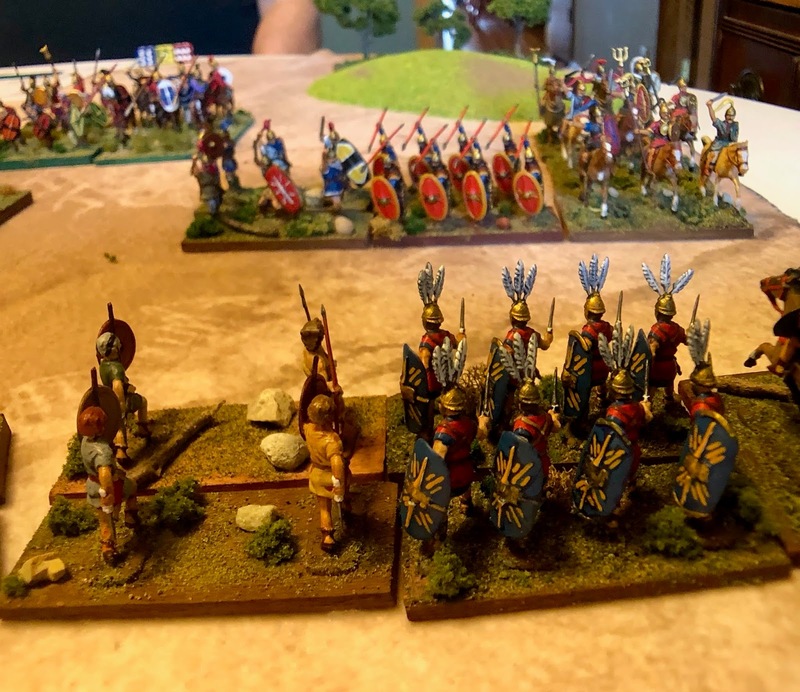 In the meantime the Carthaginian light elements on the hill will check and hold in place Minucius's legion while Mago crushes the flank. Fabius will, as he did historically attempt to withdraw and avoid a total catastrophe. Note that the elements are double stands. They act like normal elements with appropriate bonuses. I simply think the game looks better with element blocks. The Roman (me) right collapsed rather quickly as the Carthaginian (Jim) commander was aggressive. The Carthaginians achieved a major victory under Hannibal the great. The captions will tell some of the story. Following the Roman defeats at Ticinus, Trebbia, Trasimene and Umbria, the Senate elected Quintus Fabius Maximus as Dictator in command of all Roman Forces. Fabius followed a strategy of avoiding open battle with Hannibal so as to prevent any more disasters. But with Hannibal freely roaming Italy, conquering and plundering as he went, the Romans called Fabius back to Rome to explain himself. 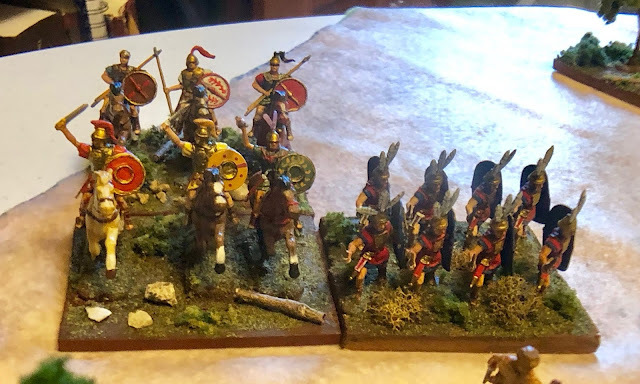 In his absence his Master of Horse Marcus Minucius Rufus initiated a successful skirmish action against Hannibal's army as it foraged around the town of Geronium. Ecstatic with this minor victory in a sea of defeat the Romans took the unprecedented step of appointing Minucius as a co-dictator with Fabius. Fabius and Minucius did not get along and so they split the army in half. Each man received 2 legions and associated allies and each camped separately near Hannibal at Geronium. Hannibal, seeing the Roman split and aware of the eagerness of Minucius for action, set a trap for him. 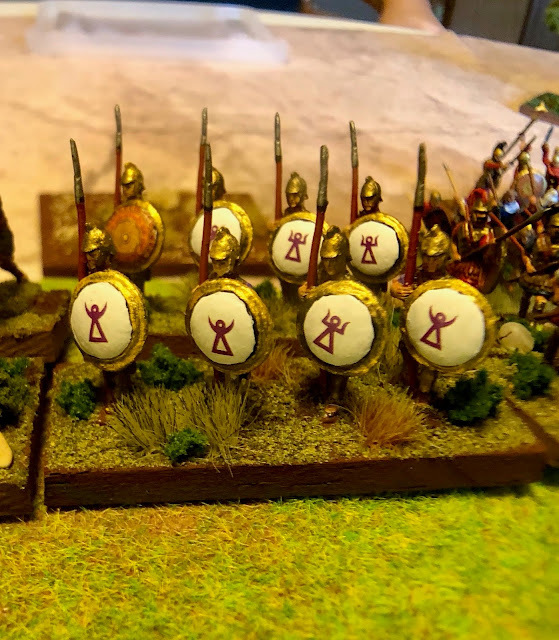 There was a low ridge in the plain between the camps and Hannibal posted his light infantry there in full view of the Romans. 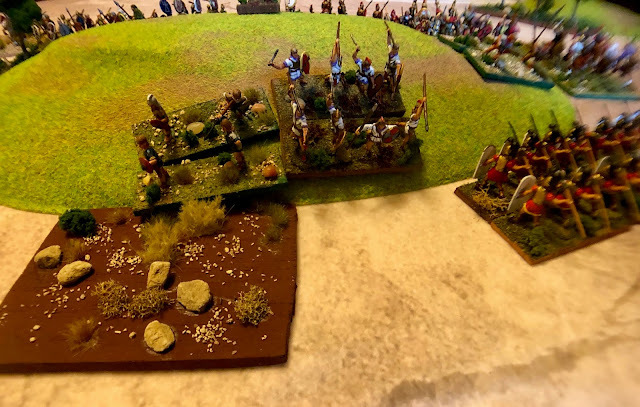 Around the ridge the ground had many dips and hollows and in these Hannibal concealed 5,000 infantry and 500 cavalry with orders only to emerge when the Romans were committed to action on the ridge. 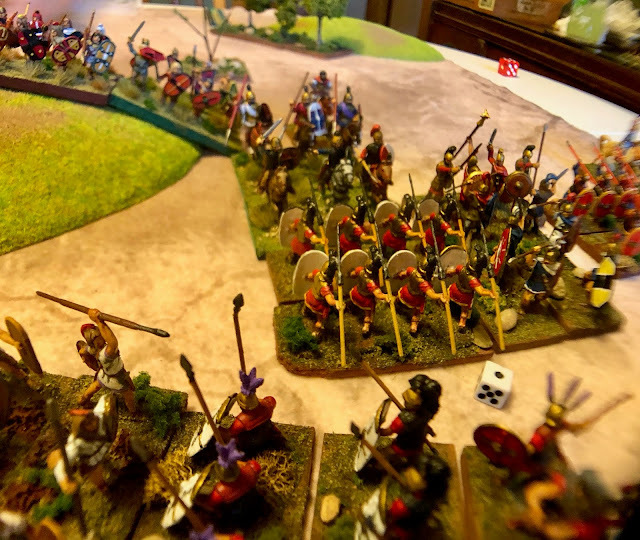 As expected Minucius took the bait and advanced on the ridge with his army. Hannibal responded by moving his own army forward in support. 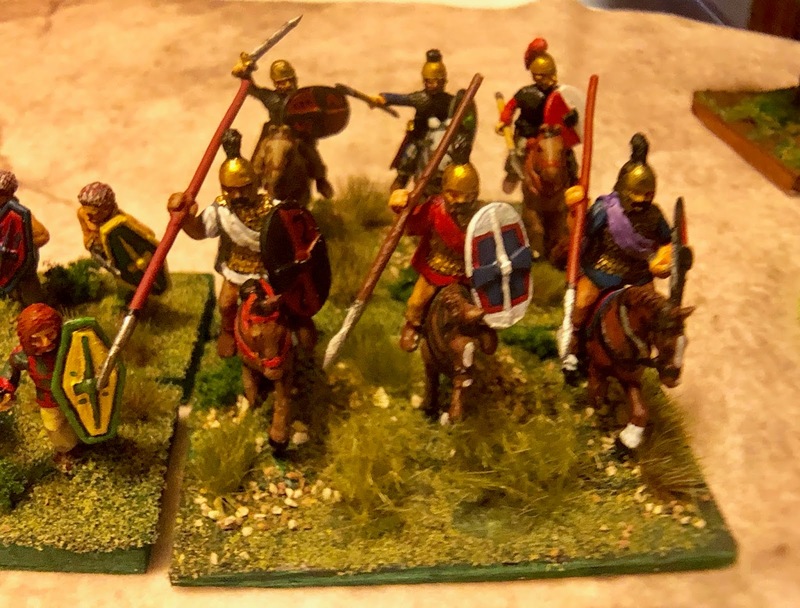 When Minucius was fully engaged the hidden troops attacked the Roman rear where they were joined by Numidian cavalry. Minucius was now in dire straits, but Fabius had been observing the action and his army was ready. 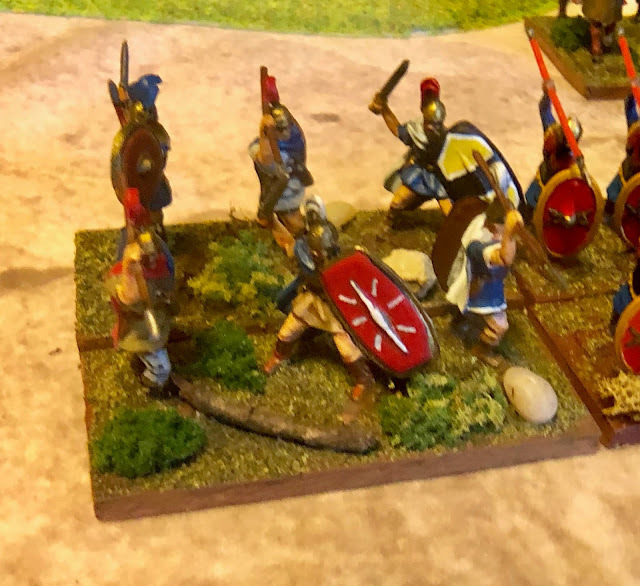 Fabius attacked the encircling Carthaginians, and seeing that they would be trapped between two Roman forces they fled leaving the battered army of Minucius to escape. Both sides now retired to their respective camps. The Romans should have learnt their lesson that they could not at this stage beat Hannibal in the field. They did not. For the following year's campaign, they raised an enormous army of approximately 80,000 men and committed them to the catastrophe at Cannae. 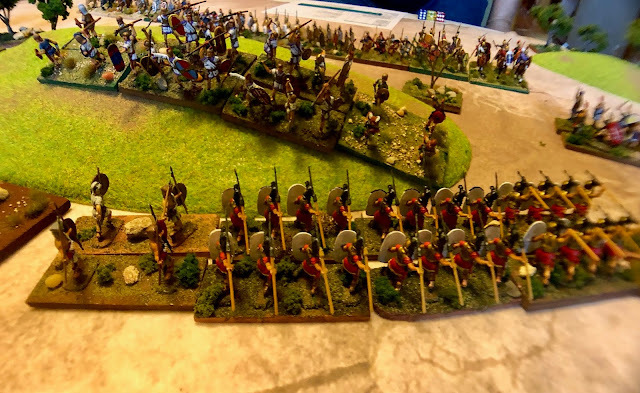 The Legion under Minucius must try to take the ridge and must advance the maximum toward the ridge according to the pips rolled . The Legion under Fabius may not move until Turn 3. 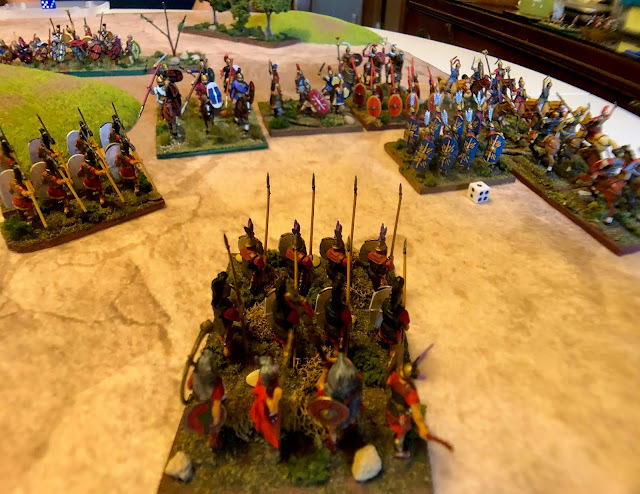 Minor Carthaginian Victory-hold the ridge and destroy 8 Roman elements not counting PS. 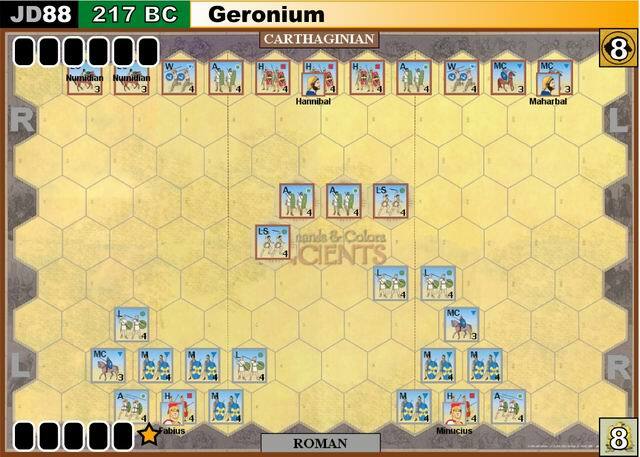 Major Carthaginian victory-hold the ridge and destroy 12 Roman elements counting PS. Sudden Death Leaders: All leader elements function as +1 to the CF except for Hannibal and he is a +2. If Hannibal dies the Carthaginians automatically lose. If Fabius dies the Romans automatically lose. Roll for lose of a leader on two dice. Roll a 2 or 3 if recoiled leader dies. Roll a 2 and not recoiled leader dies. -1 to pips of secondary leader commands if leader dies. 1. The elements in this game are double blocks but function as single elements. 2. Units that receive the bonus for a double rank are SP, WB if they initiate contact. 3. 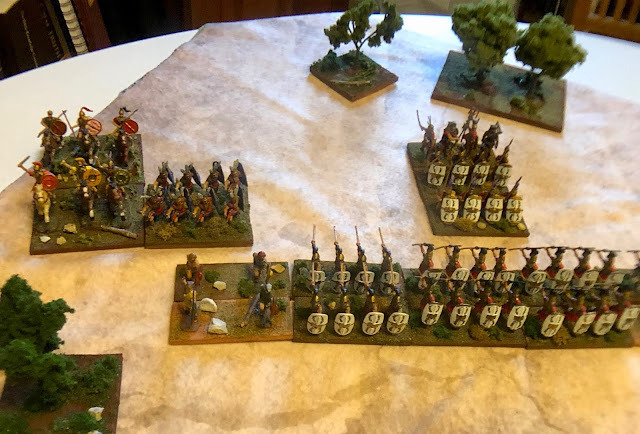 The Iberians on the ridge and the Celtiberians on the flank are rated (F). 4. The Iberian AX in Hannibal’s main line are rated Special (CF 4 -3) instead of AX. 5. Roman AX is rated as (F). 6. The ridge is bad going. 7. Elements rated as (F) or AX\ PS ignore bad going penalties. 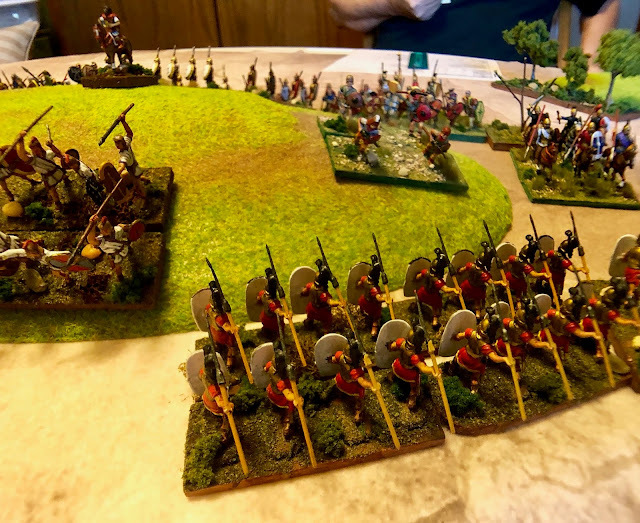 Fast moving Iberian AX and PS hold the rough going ridge tempting the Romans to attack. Figures are Hat and Newline. 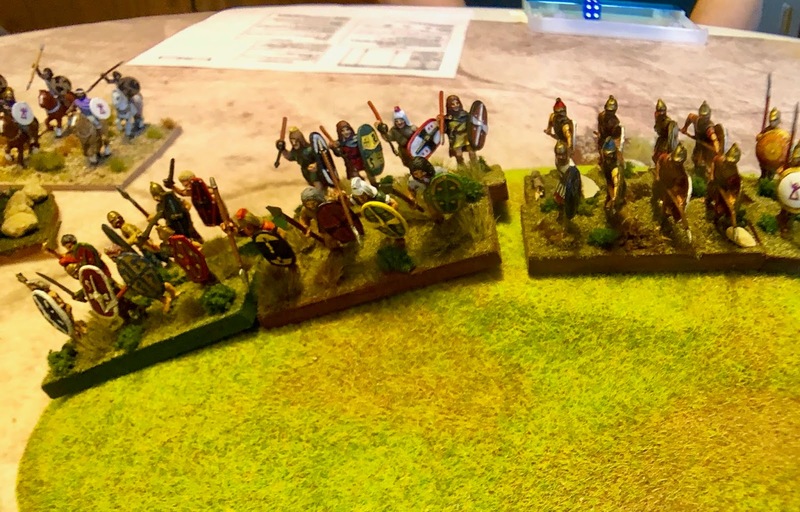 Mago's flanking ambush force of Celtienria W, Libyan SP and Iberian CV. Figures are Hat and Zvezda. 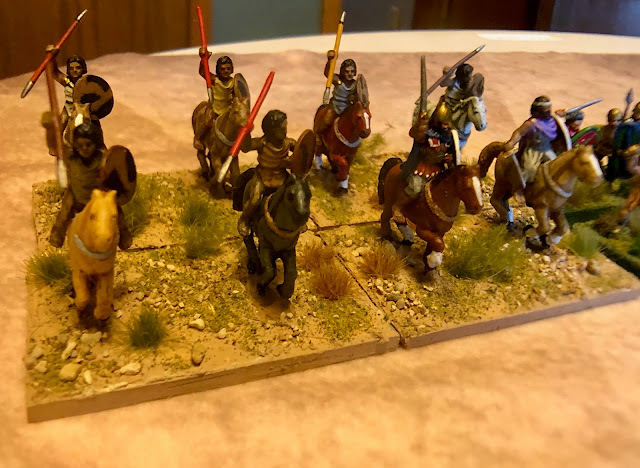 The Carthaginian right consisting of the famous Numidian LH, a Gaul WB and Hannibal's Iberians. Figures in this picture are all Newline. Hannibal out front of his Libyans and Iberians. Figures are Hat and Newline. 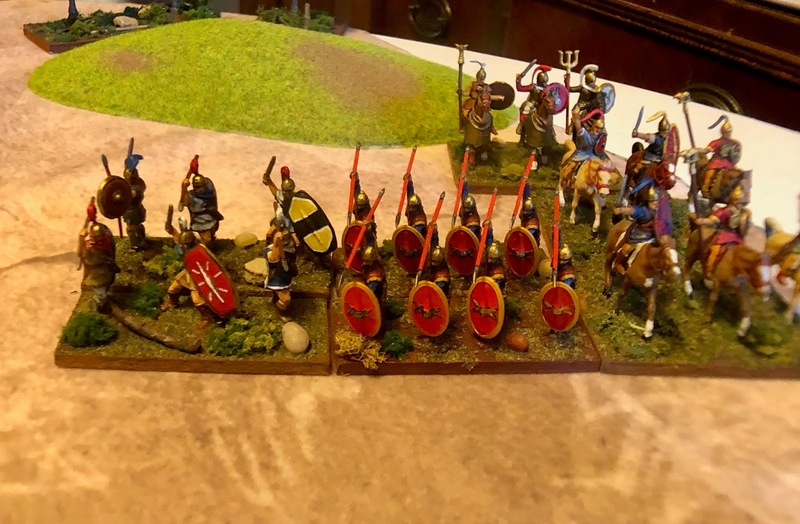 Maharbal's command of Iberian\Gaul CV, Gaul WB and Iberian AX. The Roman right that would cave in. 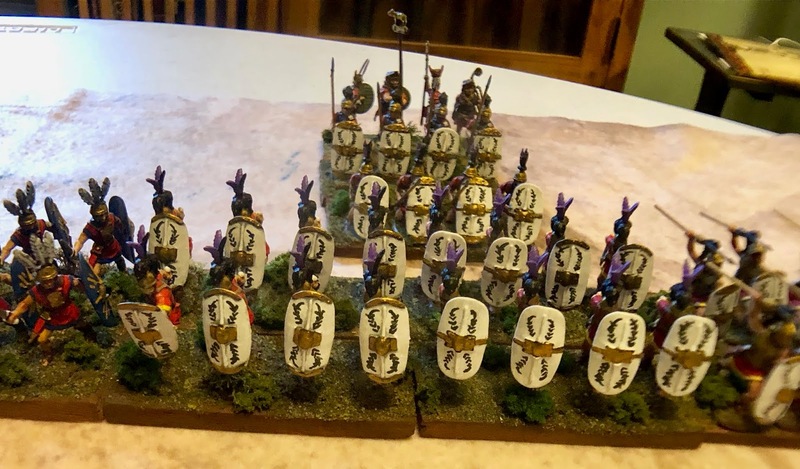 The CV are Hat and all the Roman infantry are Zvezda. The Roman left under Fabius. Fabius could not move until T3. I'm not sure it would have mattered. An intimidating sight but not today! Italian CV and Italian AX. 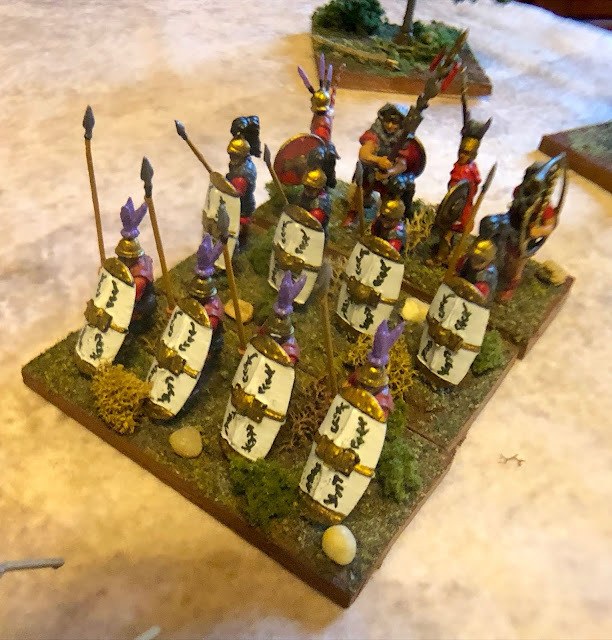 Close up of my Newline Numidian's. 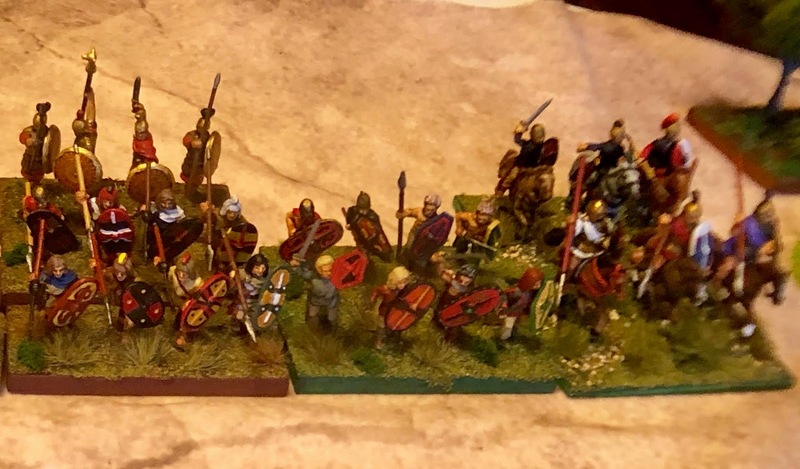 Close up of some of my Newline Gauls and Iberians. Newline Iberian and Gaul CV combined into one element. These are Hat figures. I use them as fast Celtiberians. (My rules are evolving a little with the three figure stands becoming fast as in later editions of DBA or DBM. 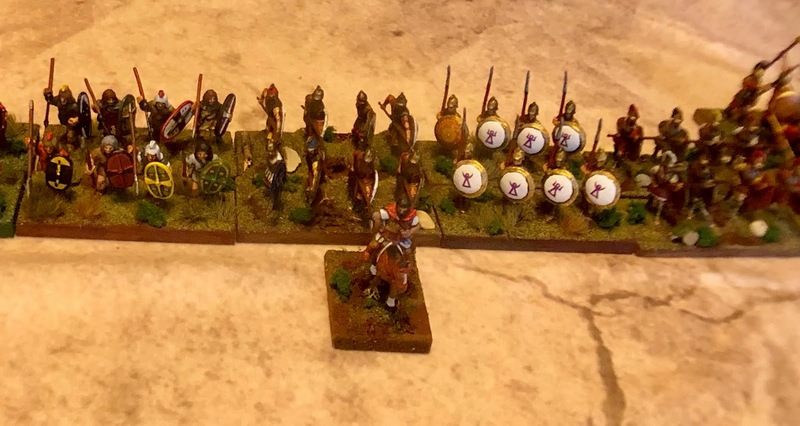 The Triarii. They ended up quite surrounded and would have perished to the last man had I not called the game. Better picture of the Iberians that held the rough going ridge. They suffered a little but checked the majority of the Legion that got sucked into the ambush. 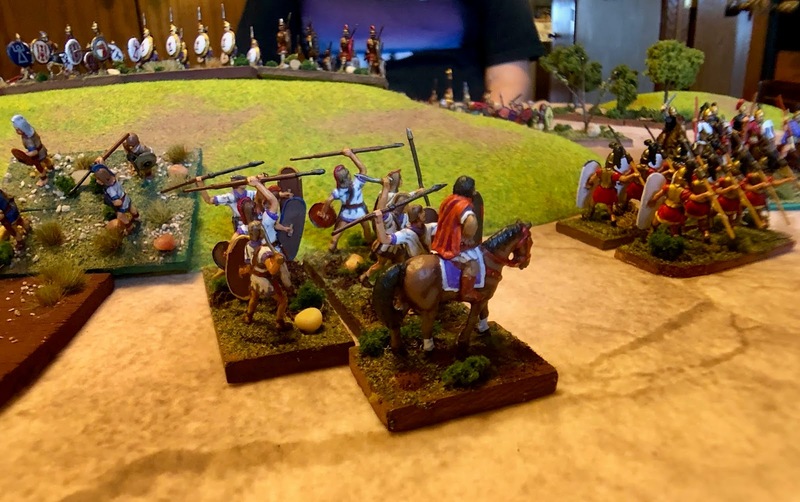 The Roman's had one shot. Turn the flank before the ambush could fully develop or die. They died. 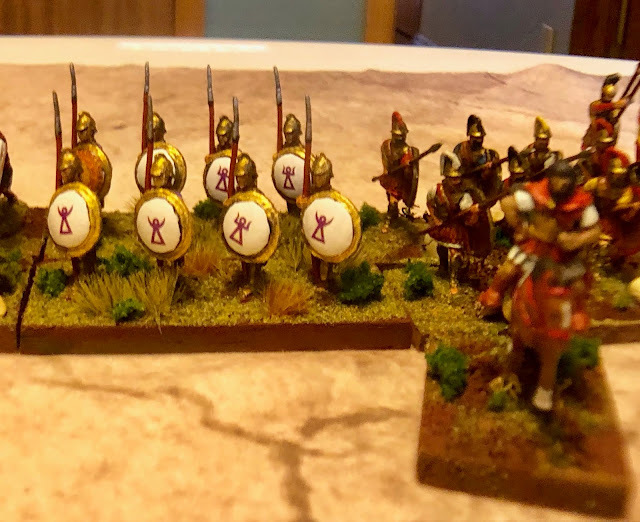 If I ever redo the scenario I may give the Romans a bit more time, but not much. This is whee the Romans had a slight chance to gain the high ground. They did not. Carthaginian Ax and Ps descend on the flank of the hapless Legion. The Triarii look defiant as the right collapses. The small white die keeps track of recoils. Accumulated recoils can destroy the unit. The Italian Ax has one recoil. They are rated superior and can take two more. Before that happened they were destroyed in a 2-1. Close up of the Newline Iberians and Gauls. There was not way Fabius was going to dislodge Hannibal's main battle line from the ridge. The end of the Roman right.